The world is watching for a decision from the New Zealand's Select Committee of Foreign Affairs, Defense and Trade, who yesterday met to consider the petition of New Zealand-based teacher, Virginia Woolf. Woolf is asking the government to ban the nation's booming trade in elephant ivory and destroy its confiscated ivory stockpile. 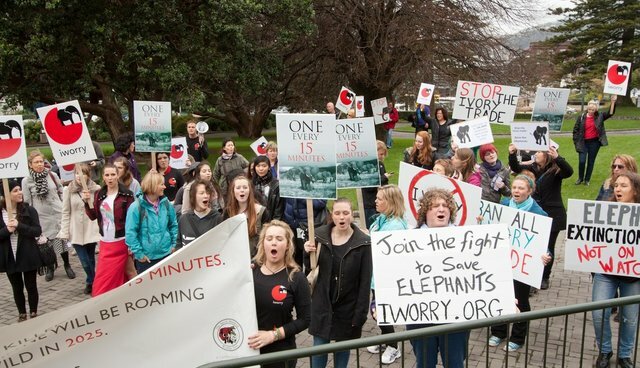 International support for increased action from the New Zealand government, to do more to combat the illegal ivory trade, is steadily growing. "Only a truly global movement can end the slaughter of elephants," Wildlife Conservation Society President Cristian Samper says, stating that such a decision by New Zealand would "show that your nation has stood up against poaching and trafficking and told the world that ivory consumption is unacceptable." Reports from U.S. intelligence agencies and the U.N. show that profits from ivory trafficking are fueling crime, corruption and violence in fragile African democracies, and financing organizations that threaten security. Samper's view is echoed by Humane Society International President and CEO Andrew Rowan. "New Zealand's close proximity to numerous biodiversity hotspots and hubs of illegal wildlife trade in the Asia-Pacific region make it an important ally," he says. Rowan considers publicly destroying New Zealand's seized ivory as an opportunity to assert regional and global leadership by becoming the first country in the region to do so, and to prohibit ivory trading. He adds that this would be a "symbolic gesture for New Zealand to show resolve in tackling wildlife trafficking." On the ground in Africa, African Wildlife Foundation (AWF) CEO Patrick Bergin says: "I cannot stress enough the crisis we are facing with regard to the survival of the African elephant." The AWF is asking every country with ivory to destroy it and every country that allows ivory trading to ban it. Bergin is of the belief that the moves "will systematically dismantle the infrastructure and incentives supporting the illegal trade and remove the very notion of ivory as a tradable commodity." Bergin also notes that it is the legal trade of ivory that is contributing to the demise of Africa's elephants, providing a convenient cover for the illicit ivory industry. Last month, New Zealand authorities laid charges relating to 31 pieces of elephant ivory. And, the nation witnessed its first ever conviction for illegal ivory trading last year. Only a few months ago, the International Fund for Animal Welfare raised concerns about the internet-based trading of endangered species products, including ivory, in New Zealand in their report, Click to Delete. Environmental Investigation Agency (EIA) Executive Director Mary Rice explains that her organization has more than 30 years' experience investigating and exposing the international illegal ivory trade. The EIA has formally acknowledged its strong support for advocates pressing New Zealand to adopt a ban on all ivory trade and to dispose of government-held ivory stockpiles. According to Tanzania Association of Tour Operators Chairman Peter Lindstrom, the loss of elephants in Tanzania, and Africa as a whole, will deprive many people of jobs, reduce a source of government revenue that plays a large part in the national economy, and see the most iconic of land mammals driven to extinction. With regard to New Zealand potentially crushing its confiscated ivory stockpile and banning the ivory trade altogether, Lindstrom says that "any gesture, however small, helps what we hope will be a groundswell that will move others to do the same." WildAid, whose ambassadors include Leonardo DiCaprio, Sir Richard Branson, Edward Norton and Jackie Chan, also supports the calls for more action by New Zealand. WildAid Executive Director Peter Knights says that New Zealand has an opportunity to "set a precedent for ivory-consuming nations by implementing a complete ban on the ivory trade in, to and from the country.". Earlier this week, United Nations Development Programme (UNDP) Administrator Helen Clark commented on the crisis: "Protecting elephants, rhinos and other wildlife used to be mainly about habitat protection; now it also involves tackling the drivers of highly organized crime that has led to a massive slaughter of Africa's iconic species." During a recent visit to Kenya, Clark signed a partnership agreement between the UNDP and Kenya's First Lady Margaret Kenyatta on work to protect elephants. Virginia Woolf, who led the New Zealand based petition to government says that "when world-renowned conservationist Jane Goodall visited our nation last month she chose to remind New Zealanders that every ivory bracelet, pendant or trinket represents a dead elephant and that a total ban on the sale of ivory is the only way forward." With such clear international support, Woolf is hopeful the committee will "not just shelve the petition but instead take decisive and positive action based on its recommendations."